It’s a cool thing to discuss why Millennials are leaving the church today, but it’s refreshing to hear from an actual Millennial. Even more so because Evans is self-professed obsessed with the church even while railing against its failings. This complicated relationship with God, religion, and the people who make up a local church makes for a compelling read, both for those who are leaving Christianity and for those who can’t understand why this is happening. The book is divided into sections based on seven sacraments, and each section is made up of various vignettes, some of which fit the theme better than others. I found myself more interested in Evans’s personal story than the think pieces she wrote. Not that they aren’t good–I just think the most important part of this conversation is individual people telling their stories of heartache, desire, and frustration. I love Rachel Held Evans because, well, honestly, because she reminds me of me. She thinks she knows best, and is therefore constantly thrown by the reality that she is not, in fact, perfect. She relies on her head knowledge and struggles to trust in her heart knowledge. She has a million ideas about how to make the world better, but she’s as much of the problem as she is the solution. I resonate so deeply with all of this, and I appreciate getting to live through her and learn alongside her. For a generation that has largely said, “count me out,” church represents a complicated relationship of both longing and apathy. There’s a history there–a past full of confusion and hurt, but a past that often is impossible to abandon. 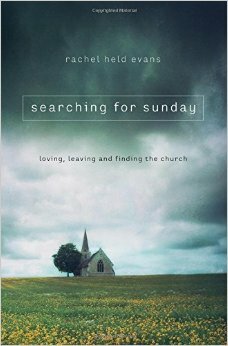 In Searching for Sunday, Rachel Held Evans exposes her own thorny relationship with the church, articulating the concerns, frustrations, and hopes of many of her peers. Through a series of stories told around the church’s sacraments–baptism, confession, and communion, among others–Evans offers the beginnings of a road map back to church and the resurrection that awaits when we are willing to give up and begin again.